The return of the greatest warrior in the universe: The Metabaron! 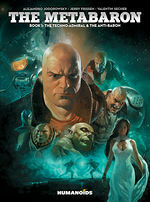 The Metabaron character was created by legendary artist Moebius and writer Alejandro Jodorowsky in The Incal, and was later spun-off into his own international bestselling series, The Metabarons, with art by Juan Gimenez. 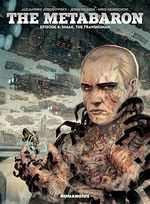 The new series The Metabaron is a collaboration between Alejandro Jodorowsky and Jerry Frissen, exhibiting the work of talented artists including Valentin Secher, Niko Henrichon and Esad Ribić. 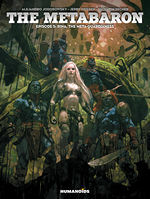 Writer/director/ producer David S. Goyer (Man of Steel, Batman v Superman: Dawn of Justice) called The Metabarons: “The greatest work of graphic fiction ever produced,” and it has sold millions of copies globally. 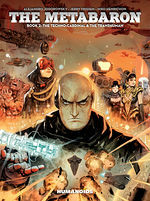 The Metabaron, returning to the land of his ancestors, Marmola, is convinced that the Epyphite, the precious resource sheltered in the heart of his home planet is trying to tell him something urgent. 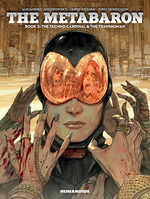 But the anti-gravitation properties of the liquid are not the only surprises now threatening the substance, or the Metabaron… With the New Golden Planet growing increasingly concerned over its shortage, and the continued threat of The Metabaron, the Techno-Pope entrusts his loyal Techno-Cardinal, Orne-8, to find the ultimate solution. 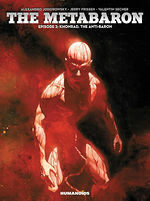 At this stage I can’t recommend this series highly enough. 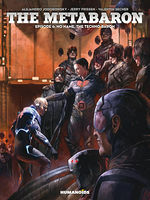 The drama; the chaos; the universe building; the shock and awe of both illustration and plot: it all binds together into one of the best sci-fi storylines I’ve read in ages. 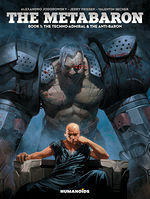 “The Metabaron: Book Two” has all the makings of a classic sci-fi and then some. If you’re a fan of the current Image Comics Sci-Fi movement, you need to jump onto this series.